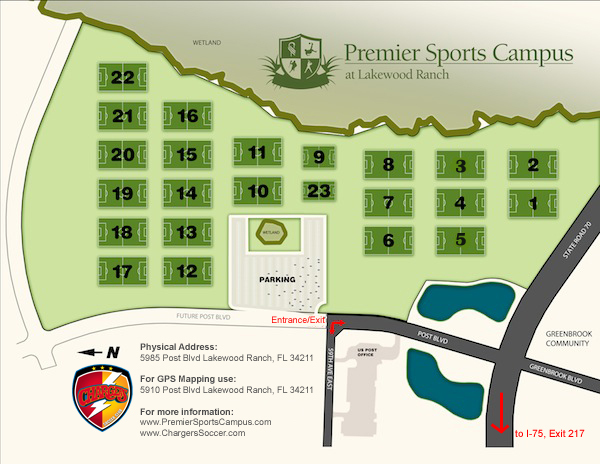 Google Map for Premier Sports Campus at 5895 Post Blvd, Lakewood Ranch, FL 34211. See directions below the map. This physical address is not recognized by some online mapping services. For GPS purposes us: 5910 Post Blvd, Lakewood Ranch (Bradenton), FL 34211. That is the address for the Post Office next to the fields. Also, if you are looking for area restaurants, coffee shops, etc., click here for more information about Main Street at Lakewood Ranch. Directions: Go south from Tampa on I-75 to exit #217 in Manatee County which is State Rd. 70, turn left heading east on SR 70 for about 5 miles, go past Lorraine Rd. to Post Blvd, turn left on Post Blvd., fields on right. Although the field layout can change from time to time based on the event, generally speaking, this is the field layout. Click here to print Field Layout Map.